Local Warwick Farm horseman Jason Coyle has confirmed an autumn campaign kick-off in Saturday’s Breeders Classic 2018 for his Coolmore Classic-bound mare Slightly Sweet. Slightly Sweet will kick off an autumn bid targeting the Coolmore Classic in this Saturday’s Breeders Classic 2018. Photo: Steve Hart. The headline Warwick Farm race on the weekend, this season’s Group 2 $200,000 Breeders Classic (1200m) attracted just the nine mares at nomination stage. Among them is the Coyle-trained Charge Forward six-year-old Slightly Sweet who hasn’t raced since a third to Shiraz at Rosehill last July in the Listed Winter Challenge (1500m). After a lengthy spell, the proven miler has trialled twice this year ahead of her first-up run on Saturday including a third behind Testashadow (1st) and Hartnell (2nd) over 1000m at Warwick Farm on February 1. 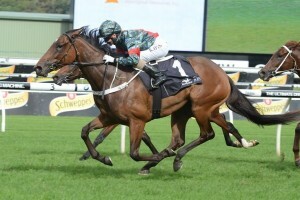 Coyle knows the Breeders Classic will be a testing first-up run for his dual Group 3 winner, the race set to feature the likes of the Gai Waterhouse & Adrian Bott-trained Myer Classic fourth placegetter Prompt Response and Bjorn Baker’s last start Magic Millions Sprint third placed mare Egyptian Symbol. He remains confident however that Slightly Sweet will improve on whatever she does over the 1200m on Saturday as the mare prepares for a shot at the Group 1 $600,000 Coolmore Classic (1500m) at Rosehill Gardens on March 17. “She will run on Saturday and we want to get her up to 1500 metres again,” Coyle told AAP this week. Steps In Time (2nd in 2014) was the last Coolmore Classic winner to back directly up off a Breeders Classic run. Two of the subsequent three Coolmore Classic champs came off a run in the Group 2 Millie Fox Stakes (1300m), the Rosehill event running this autumn on February 24. Slightly Sweet has raced in four previous Group 1 races but none since her 10th to Azkadellia in the 1 Queen Of The Turf Stakes (1600m) at Randwick in April of 2016. She also contested that year’s Coolmore Classic when eighth to Peeping in a race Azkadellia ran second in. To back Slightly Sweet first-up in the Breeders Classic 2018 field on the weekend and for access to the top Group 1 racing odds over the autumn visit Ladbrokes.com.au today.